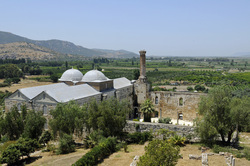 Located 6 miles away from Selcuk town, popular village. First inhabitance dates back first century. 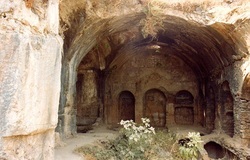 The early christians from Ephesus escaping from the prosecutors founded the village. This was a Greek Orthodox village till 1924. Was named as "Cirkince" meaning the ugly for while. Indeed its inhabitants gave this name on the purpose as they did not want to be bothered by foreigners nor to share the beauty of their village. Still after years, visitors understood that the village was not ugly and called it "Sirince" meaning the pretty. Today the village is a perfect synthesis of Turkish-Greek culture as of the 1920's; after the Turkish Independence War, people exchange between Greek and Turks has occurred and all those typical Greek houses, though they kept their original outside characteristics, have received the local layout inside. At Sirince Village you will have chance of seeing the local life at a village and purchasing some small local souvenirs and handicrafts. The village is also famous for its local grape and other fruit wines. The Seven Sleepers, commonly called the "Seven Sleepers o Ephesus", refers to 7 early christians who lived in Ephesus in the 3rd century A.D, in the time of the Roman Emperor Decius. This was the time of persecution to the Christains. These 7 young men hid inside a cave outside the city of Ephesus around 250 AD, to escape from the persecution of Christians. Having fallen asleep inside the cave, they slept approximately 150-200 years and woke up during the reign of Theodosius II, They so hungry, they sent one of them to get a bread. The shop keeper was so suspicious when the guy tried to give him a 200 years old coin. He called guards and these 7 young man got arrested. Later on they are treated as holy people. Theodosius the Roman Empreror wanted to visit these 7 early Christians but by the time he arrived they all died since they were physically very old. They got burried into the cave they were asleep. Later on people wanted get burried close to these holy people. The story is also mentioned in the book of Quran. While not giving the number of youths involved, the Quranic version of the Seven Sleepers story largely parallels the Christian account. Unlike the Christian story, the Islamic version includes a dog who allegedly accompanied the youths into the cave, and kept watch at the entrance for the entire time that they were asleep In Islam, these youths are referred to as "The People of the Cave".